I used to have a weakness for bran muffins. Not the homemade kind, but the ultra-sweet, supersized variety that I could pick up on my college campus. I’m sure they weren’t remotely vegan, but I loved them: there was something so irresistable about the dense texture, the deep color, the contrast of earthy bran and sweet, plump raisins. 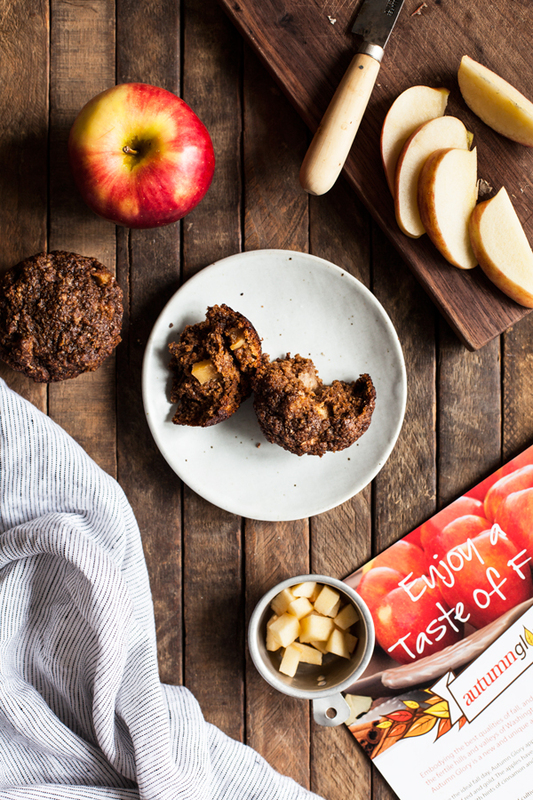 It’s been a long time since I’ve had proper bran muffins–probably years–and these vegan apple bran muffins are my effort to re-create all of the things I love about the muffin with slightly more wholesome ingredients, not to mention the addition of moist, juicy apples. The apples in question here are the sweetest and most flavorful I’ve had in a long time: they’re Autumn Glory Apples, which taste amazingly like caramel and cinnamon (when I first tried them, I immediately thought of candy apples, but there was no sticky caramel coating in sight). They’re the essence of fall, but their season stretches right through wintertime, for which I’m grateful. 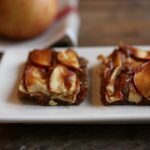 Because the apples are so naturally flavorful, the they’re ideal for everyday snacking (dipping them in almond butter is pretty heavenly, too). 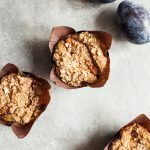 But they also have the perfect juicy, crisp texture for baking, as I learned when I folded them into these easy, healthful snack muffins. The muffins get a double dose of apple, from both the fresh, diced Autumn Glory Apples and also applesauce, which I used to add moisture. In the past I might have used raisins as a mix-in for the muffins, but I so prefer the use of apples here. 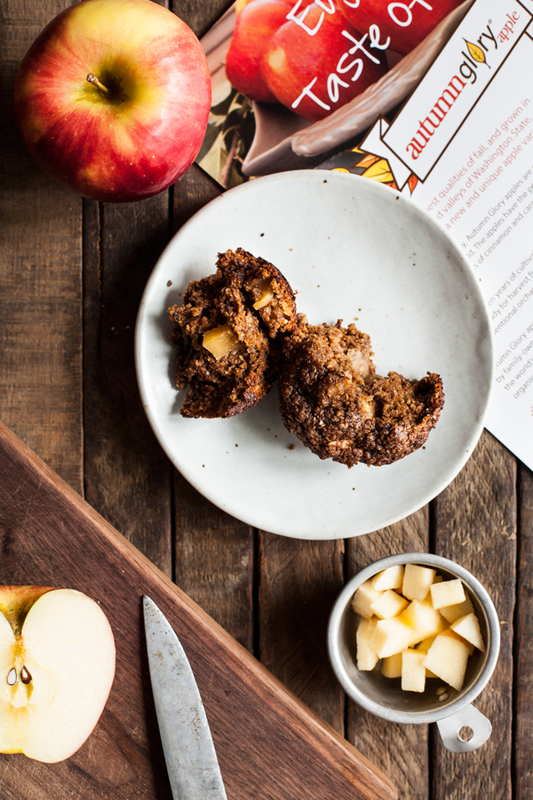 They create juicy, fresh pockets of texture throughout the muffins. 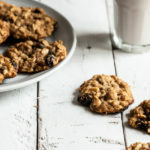 Of course, you could add dried fruit to the muffins if you like, or you could add some crunch by stirring in chopped walnuts, pecans, or pumpkin seeds. 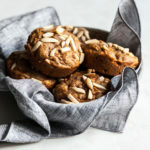 No matter what, these muffins are packed with fiber (thanks to the oat or wheat bran), iron (thanks to a little molasses for sweetening and color), and they’re just a little richer in protein than your average breakfast muffin–especially the muffins I used to get! Preheat your oven to 350F and lightly oil or line a muffin baking pan. In a large mixing bowl, whisk together the flour, bran, sugar, baking powder, baking soda, ginger, cinnamon, cloves and salt. Fold in the apple pieces, making sure they all get nicely coated. In a separate bowl, combine the applesauce, flax egg, oil, and molasses. Add the wet mixture to the dry ingredients and mix until everything is just combined. Divide the batter evenly into the prepared muffin pan. Bake for 18-24 minutes, or until the tops of the edges of the muffin tops are just browning and a toothpick inserted into the muffins comes out mostly clean. Muffins can be stored in an airtight container in the fridge for up to 4 days or individually wrapped and frozen for up to 1 month. *Gluten free, all purpose flour can be used in place of spelt. **To prepare a flax egg, whisk together 1 tablespoon flax meal and 3 tablespoons warm water, then allow the mixture to thicken up for a few minutes. The next few months are going to be busy ones, and busy in a different way than the last few have been. This past fall I was burrowed into book writing and recipe development, which meant that I could work from home most of the time. This winter I’ll need to be on-the-go a little more often, which means that I need tasty, healthful, reliable snacks. My wintertime snack cravings are a bit denser than my summertime ones, which is to say that a wholesome muffin appeals more than a piece of fruit. 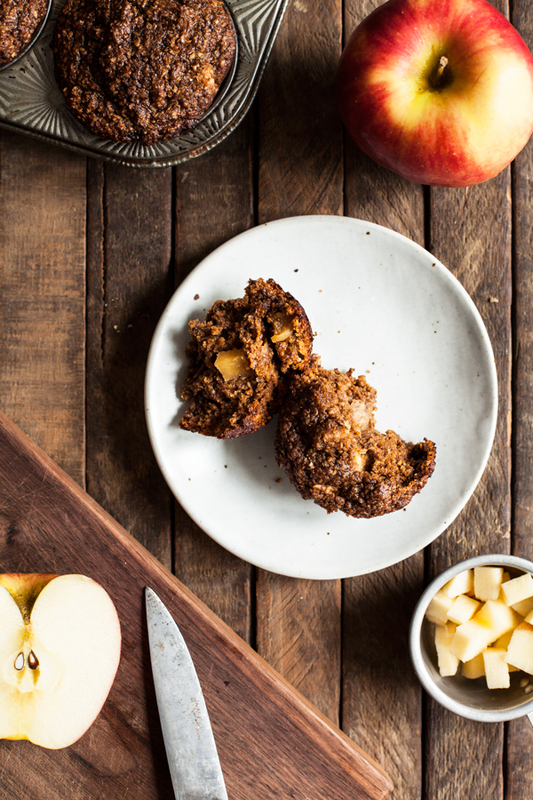 I know these bran muffins will be just what I need, and I’m sure I’ll be whipping them up often. 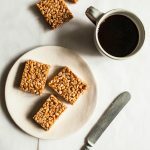 Perhaps you’ll try these for a vegan snack, too, or you’ll pair them with something for an easy breakfast on-the-go. No matter what, I hope you enjoy the texture, taste, and the juicy bites of apple within them. It’s hard to believe that we’re now in the final days of December, preparing ourselves for a new year. I’m giving some quiet thought to how I’d like to think about and approach 2017, and I’m sure that I’ll have more to say on Sunday, when I check in with weekend reading. As far as the coming month is concerned, I think it’s a good time to focus on simple, hearty food, and those are the sorts of recipes I’ll be sharing, starting with an easy skillet meal on Thursday. Stay tuned! This post is sponsored by Domex Superfresh Growers. All opinions expressed are my own, and I love the flavor of these juicy, sweet apples. Thank you for your support! Mmm and molasses too?! These are lovely! love simple ingredients list for the muffin. I can definitely seeing myself making these. Me too, Gena! I fell in love with bran muffins in college, and they weren’t the healthy sort either. 😉 I would love to try out your vegan version here, as they look wonderful and sound so warm and fragrant with all of those spices. And your new site- it’s so fun and clean, with a beautiful new logo and such great bold typography. Really really great! Hello Gena- this recipe looks amazing. I am not a baker so have no experience with substitutions. I do not use oil and wondering if you could recommend a substitute for the oil that would not compromise the receipe. You can replace the oil with the same amount of applesauce or pureed prunes. The texture of the muffins will be slightly denser (and maybe less moist) than it would with the oil, but you’ll get the best results that way. I hope the recipe is a hit! It’s been years since I’ve had a bran muffin, but I love them too!! I should really make these. I haven’t seen Autumn Glory apples, but I hope to find them somewhere. I love trying new varieties of apple! I don’t think I’ve ever had a bran muffin quite like the one you’ve described- they’ve always been rather dry, and either dusty or unpleasantly sweetened. But your description sounds magical. I’m not a vegan, but one of my resolutions for New Year’s is to try new techniques and to rely on less animal products. I can’t wait to make these. Made these this morning – they turned out very dry. Is the batter supposed to be so thick after mixing? It was the thickest muffin batter I’ve ever worked with. Muffins were pretty dense after cooked as well. The flavour is good though. The batter should be thick–thicker than other muffins–and the finished muffins should also be a be denser than the norm, as bran muffins sometimes are. But the texture definitely shouldn’t be dry! It’s supposed to get nice and moist. Sorry that you had that result. Oddly, after sitting in the ziplock overnight, they now are wonderfully moist, and texture has improved a lot! They are “acting” more like muffins today, and I’d say the flavour has deepened! It’s my first time working with spelt flour, perhaps that’s why I was surprised. Thanks for the quick reply! It was delicious! I didn’t have apple sauce so I substituted it with jam that was sitting on the fridge shelf too long. It turned out well! This is simple and healthy snack! I think almond flour and almond (or coconut) milk both of those would work! Gena, these turned out so beautifully, I can’t stop eating them. At least I’m getting a whole bunch of fiber. Thanks for the recipe! I’m so glad that you’re enjoying them, Erin! Hi! I just came across this recipe yesterday and was inspired to try it. 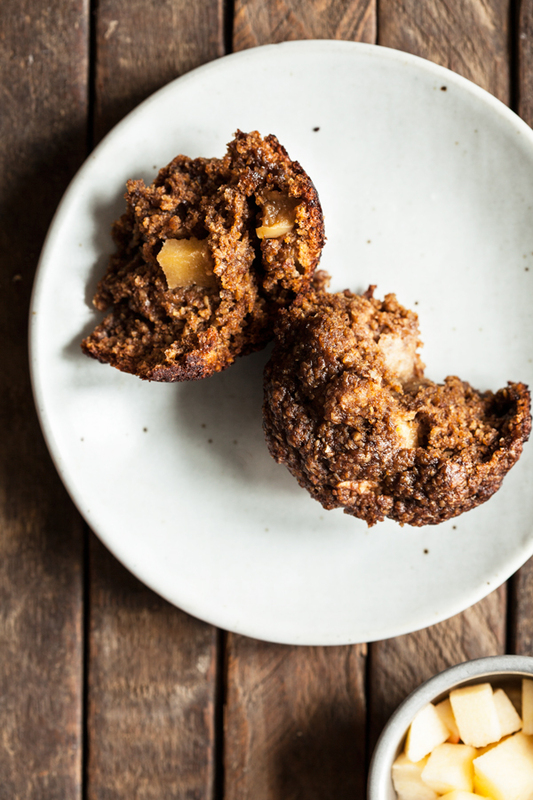 I had to leave out ginger and clove because I didn’t have any in my stash and I only had a single apple, but I have to say these are my new favorite vegan bran muffins of all time…I love the apple bits in them. It adds a whole new dimension to the texture and flavor. Thank you for posting this recipe. Thank you for sharing your recipes, Gena. They’re very much appreciated. Wishing you peace & blessings. Peace and blessings back to you! So glad you enjoyed the muffins.